We regret to announce the death of Colonel Charles Cumberlege on Monday 28th November, aged 77. Charles commanded the 1st Battalion in Gibraltar 1982 – 84. Charles leaves his wife, Jo, and children, Jonathan and Vanessa; and grandchildren William, Kitty, Jemima, George and Phoebe. 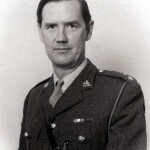 You can read Colonel Cumberlege’s service recollections in the CO’s Service Recollections section.